In your Inspector, locate the Daggerfall Unity (Script)component and click Browseto point Daggerfall Tools for Unity toyour Daggerfall installation’s Arena2folder.This is where all of the game files such as textures, models, and layouts are stored. I have this. And nooby quesion - where to click? looks like some scripts not work but don't know why. Your scripts are all broken for some reason. Here's an abbreviated guide to getting started again. Make sure you're using Unity 2018.2.11f1 specifically and clone the latest source from github. Open the project in Unity and wait for it to compile. Open "BasicScene" from Assets/Scenes. 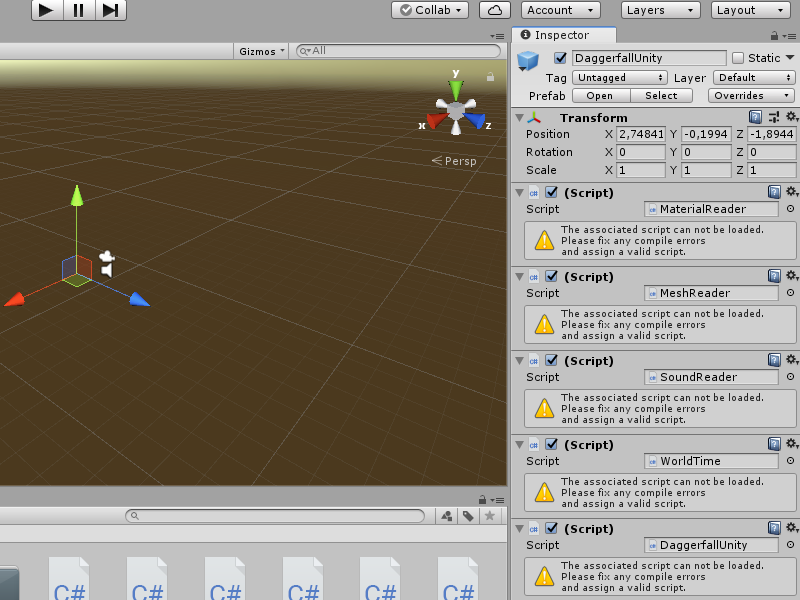 This has the minimum number of GameObjects required to work with DFTFU editor tools. If you've played Daggerfall Unity already, it will automatically pick up your Arena2 path from your game folder, otherwise click Browse (see screenshot) and give it your Arena2 path. 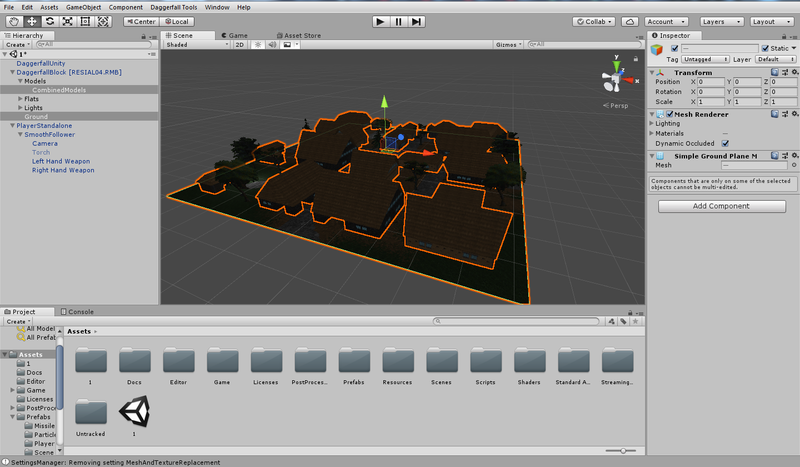 From there, you can click Import to inject some assets like blocks or towns. Please keep in mind the tutorials are very old at this point. If you'd like to work through them directly, they should still work with the old standalone DFTFU download you can import as an asset on this page. Ah, it probably wrong unity version, just in tutorial was specified only "5.4.0f3 or more high"
I might have figured out the problem. Is it correct that you have to have the files cloned from github then import the DFTFU into that? The tutorial doesn't list that step. I just imported it into an open project and got the following errors listed below. Warning	There was a mismatch between the processor architecture of the project being built "MSIL" and the processor architecture of the reference "mcs", "x86". This mismatch may cause runtime failures. Please consider changing the targeted processor architecture of your project through the Configuration Manager so as to align the processor architectures between your project and references, or take a dependency on references with a processor architecture that matches the targeted processor architecture of your project. Daggerfall Tools For Unity.Plugins"
did you select API compability level 2.0 in project settings/player/configuration?